Remember the awkwardness of a blind date? Playwright Jon Lonoff does. And he’s written a doozy in his 2003 comedy, “Skin Deep,” for a couple of gun-shy, middle-aged never-been-marrieds. Maureen Mulligan, who is, shall we say, pleasingly plump, had her heart seriously broken years ago. Joe Spinelli is a nice guy, but perhaps a bit too forthright and abrupt, and not so suave linguistically. They’ve been set up for a coffee date, and Joe’s 2½ hours late. Inauspicious beginning. Maureen’s already gotten her laundry — and ice cream — out. But the delightful duo at Scripps Ranch Theatre really make that meeting pop — with a credible discomfort everyone in the audience can feel. Brenda Adelman and Daniel Gurian get it just right, from the uncertainty to the New York accents, throughout the cute, sitcom-y play. The two meddlers who set up — and then nearly ruin — the whole deal are Brenda’s sister and brother-in-law. Sheila (Cindy Chavez) is addicted to “enhancements” (i.e., interminable plastic surgery), so she can hold onto her husband, Squire (Charles Peters), a compulsive flirt. Speaking of obsessive behaviors, Maureen’s relationship to food is akin to moths and flame or flies and flypaper. A whole extra-large pizza or a takeout Chinese dinner for two are routine in Maureen’s disheveled Queens apartment, circa 2003 (were there really still dial phones in 2003? Even in the outlying areas of Queens?). So, she’s by no means ready for a human relationship with a genuine, sensitive guy like Joe, even if he is a little rough around the edges (she’s a college grad; he runs a restaurant).They know intuitively that this may be the last-chance café for both of them. 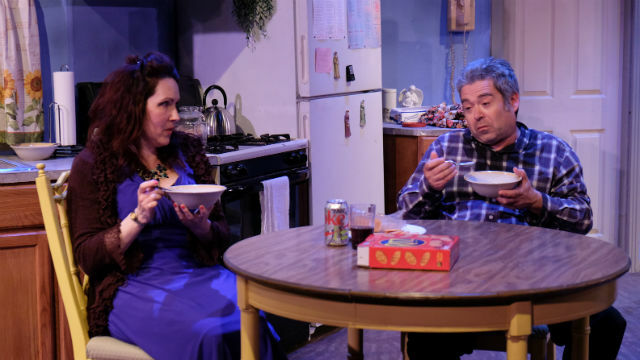 Under Eric Poppick’s direction, the dialogue is snappy, though the pace could be a bit brisker; these are New Yorkers, after all (though, in terms of regional dialect, Maureen’s sister and brother-in-law must’ve grown up in some other city). The set (Bob Shuttleworth), lighting (Chad Oakley) and costumes (Mary Laron) are serviceable, and there are plenty of comical and poignant moments – and a few sappy ones, too, toward the end. But playwright Lonoff generally leavens them with a dollop of humor. One could have a few quibbles with both play and production, but mostly, this is an enjoyably frothy comedy with a bit of grit underneath. Performances are Friday-Saturday at 8pm, Sunday at 2pm.